French Onion Soup was introduced to me in my 20s at a restaurant on the Plaza in Kansas City, MO. It was highly recommended and I have been in love with it ever since. Thank goodness food processors were invented to help with the teary slicing duty to make this dish. This recipe is so simple yet so yummy. I have also added left over roast beef bits if I have them on hand. Take it for a spin and see if it is a hit at your house! 1. Heat butter in large skillet. 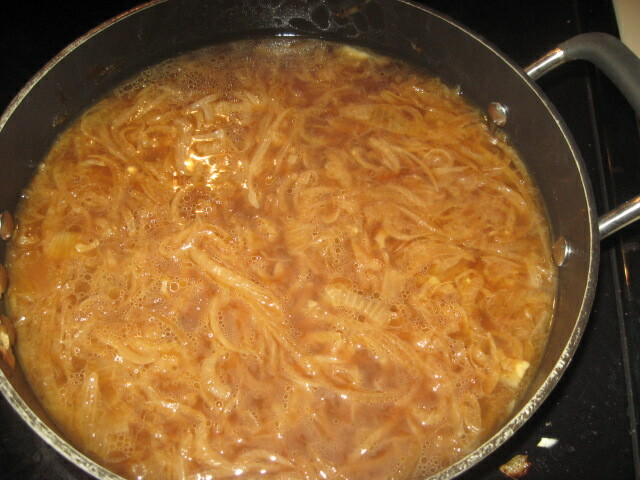 Add onions and saute’; stirring until golden–about 8 minutes. 2. Combine onion, broth, and salt in medium saucepan; bring to boiling. Reduce heat and simmer, covered, 30 minutes. 3. Meanwhile, toast bread slices in broiler until browned on both sides. 4. Sprinkle one side of each with grated cheese; run under broiler about 1 minute, or until cheese is bubbly. 5. To serve: Pour soup into a tureen or individual soup bowls. Float toast, cheese side up, on soup.